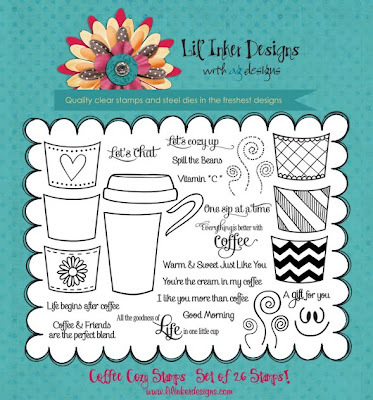 Lil' Inker: New Release Hop Day One - Coffee Cozies! New Release Hop Day One - Coffee Cozies! YAY! I can finally share this set with you! 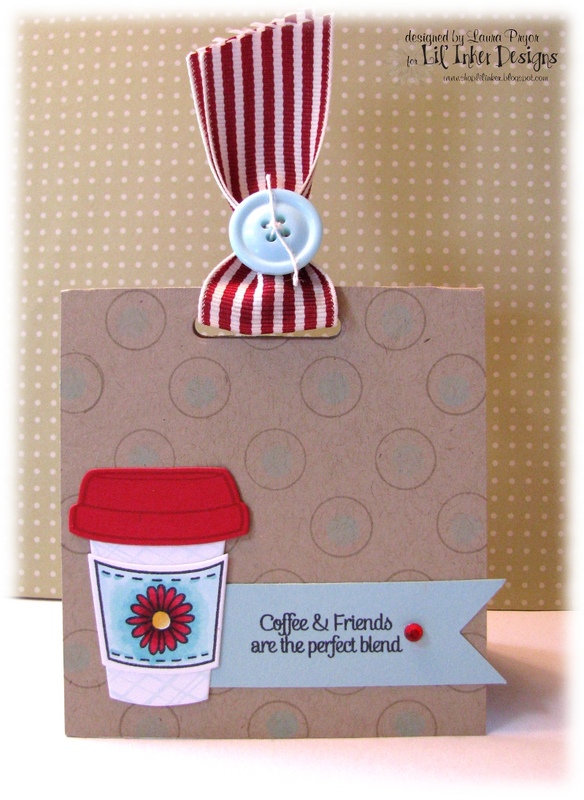 Welcome to our New Release Hop Day One....Introducing Coffee Cozies!! We have been working so hard on this set for what seems like FOREVER! I really wanted to bring you a set of dies and stamps which focuses on the cutest part of coffee, the cozy! What's a coffee cozy you ask? Why, it's the little sleeve that goes around your to-go cup, of course! 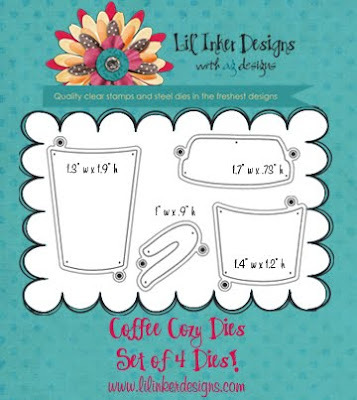 This set includes 4 dies: coffee cup, lid, cozy and handle which can be used to make a cute to-go cup or even a sweet little mug...mixable and matchable for that perfect cup! The coordinating stamp set includes 26 stamps, our largest set yet and includes cute images to dress up your cozy as well as many wonderful coffee themed sentiments like "Good Morning" and "Warm and Sweet Just Like You" which are done in a lovely and decorative font! There's even a fun smiley and steamy swirl stamps...lots and lots of possibilities with this fun set! A VERY special thank you to Heidi Schwoerer of 2 Cute Ink, contributing artist on the Coffee Cozy set! Thank you, my dear! Heidi took my hand drawn art which wasn't TOO BAD (LOL) and made it into something adorable! Round of applause for Heidi!!! Let's have a look at a project I made using this set to help you fall in love with it as much as I already am! If you'd like to use the registration marks for perfect stamp placement you will want to run your dies through your cutting machine using a scrap piece of paper. It's the negative here that will give you the perfect placement. See those extra holes the die cut out on the negative? Those are the registration marks and they are the key to proper alignment. Put the negative aside for now...but KEEP it with your set when you store it so it can be used over and over again. To begin, first stamp your image...color it to your heart's content or stamp it with dye ink in your favorite color...and when it's perfect and ready for cutting lay the die negative (from above) over your stamped image and line it up so that there's nice, even white space all the way around your stamped image. Using a pen or marker(I like marker best)fill in the holes in the negative then remove the negative. Now, lay your die over your stamped image and line up the markings on your sheet so you can see them through the holes in the actual die and CUT! THIS method will yield you perfect results. BUT, you do NOT HAVE to use this method for perfect alignment. Ariana and I designed this set in such a way that you can use the standard, slightly faster method of die cut first, then stamp by eyeing just as easily and effectively and pretty darn perfectly too! Again, this new method I described above is an option that we thought it would be nice for you to have!! I like options! So my first project above is what I thought would be a super cute way to give a coffee gift card to a friend or the babysitter or a thank you for a neighbor! Of course I didn't get a picture of it but I actually made a pocket on the back of this tag so the gift card has a nice little place to sit! 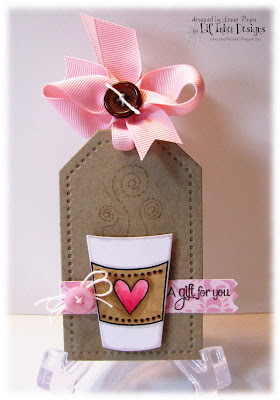 I just love this combo of kraft and pink and I think that the heart is my favorite cozy stamp! You likey? I just love that you can mix and match colors to make infinite coffee cup combos! This one uses an aqua and red combo that I just love as well as the flower cozy stamp and possibly my favorite sentiment from this set. Here I used the "l" from our Jingle Joy set to create the perfect slit in the top of my card where I threaded my ribbon! Ok, ARE YOU READY FOR MORE???? We are giving away prizes this week as we celebrate new release week so don't forget to comment all along the hop each day. We'll be giving away a $10 store credit and our 2 Cute Ink set releasing this month which we'll be showcasing here beginning Wednesday. Now, I'm going to send you on your way to Design Team Member Alicia Thelin's blog so you can see what's up at Scrappy Betties! Have fun today! I can't WAIT to hear what you think of this new set! Oh and one more thing before I forget BOTH of our releases are available for purchase at the LID Shop today so that if you want them both they're yours for the taking with no waiting! Thanks for stopping by today! We'll see you tomorrow for hop day 2 and more fun with Coffee Cozies! Hi Laura, I love these stamps, they are right up my alley, can't wait to start hopping! 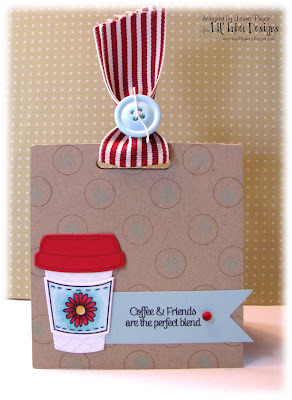 Great projects and love these new dies and stamps. Great sentiments. What a great set...love your tag and card. SUPER DUPER CUTE dies and stamps!!!! LOVE 'em!! !